The transition between planktonic growth and biofilm formation represents a tightly regulated developmental shift that has substantial impact on cell fate. Here, we highlight different mechanisms through which bacteria limit their own biofilm development. The mechanisms involved in these self-inhibition processes include: (i) regulation by secreted small molecules, which govern intricate signalling cascades that eventually decrease biofilm development, (ii) extracellular polysaccharides capable of modifying the physicochemical properties of the substratum and (iii) extracellular DNA that masks an adhesive structure. These mechanisms, which rely on substances produced by the bacterium and released into the extracellular milieu, suggest regulation at the communal level. In addition, we provide specific examples of environmental cues (e.g. blue light or glucose level) that trigger a cellular response reducing biofilm development. All together, we describe a diverse array of mechanisms underlying self-inhibition of biofilm development in different bacteria and discuss possible advantages of these processes. Biofilm inhibition in S. elongatus by an extracellular inhibitor. Wild-type cells produce and secrete an inhibitor (red ‘no-entrance’ sign) that suppresses transcription of the genes Synpcc7942_1133 and Synpcc7942_1134. Inactivation of t2sE, encoding a homologue of subunit E of type two secretion systems (T2S), enables biofilm development. 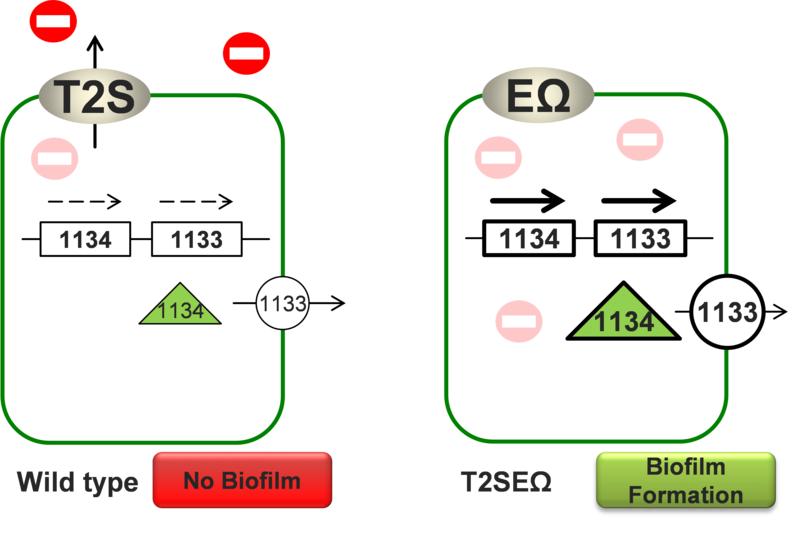 The biofilm-forming mutant, T2SEΩ, is most likely impaired in secretion of the inhibitory factor, and therefore expresses ‘biofilm-genes’ at a higher level, and develops biofilms. To be or not to be planktonic? Self-inhibition of biofilm development.